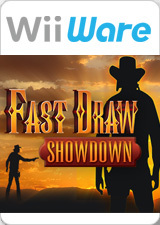 Fast Draw Showdown is a live-action on-rails shooter video game, released by American Laser Games in 1994 for arcades. The game uses laser disc technology and a light gun to allow the player to shoot live-action actors. It was ported by Digital Leisure to WiiWare in 2010. The game revolves around a series of gunfights where the player must attempt to out-draw the villains. Using a Wii Remote in place of the light gun in the original arcade game, the player must first "holster" his gun, and wait until a signal is given to draw, aim, and kill the villain before the opponent fires. A foul occurs if one draws the gun too soon, with a maximum of three allowed, and a chance to face Wes Flowers is only given if all four of the previous gunfights are victorious for the player. The graph below charts the compatibility with Fast Draw Showdown since Dolphin's 2.0 release, listing revisions only where a compatibility change occurred. This page was last edited on 19 March 2018, at 02:34.